In this issue of “Paranormal Underground” magazine, we spotlight the ParaGhost InvestHunters team and the “Were Zoo" book series author R.E. Butler. In our Case Files of the Unknown, we feature the “Devil’s School”; the history of ghost hunting; and the power of storytelling. 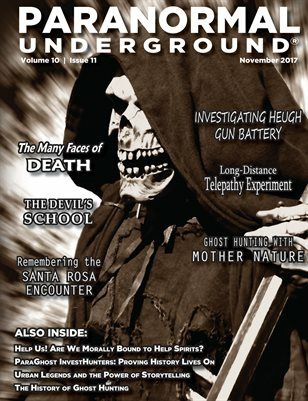 Also in this issue, don’t miss our coverage of a conversation with Vincent Price, ghost hunting with Mother Nature, how death has been personified through the ages, and a paranormal encounter with an alien in Santa Rosa, New Mexico. Plus, we cover an investigation at Heugh Gun Battery in the U.K., publish an excerpt from “The Curse of the Pharaohs’ Tombs” book, and hear one perspective about time synchronicities like 11:11.